Reel Talk Online: Is This the Face of Someone You Want Cooking Your Food? Is This the Face of Someone You Want Cooking Your Food? I jest, of course. Because obviously this is Bradley Cooper playing a chef on this new poster for BURNT, the upcoming film co-starring Uma Thurman and Omar Sy. But he doesn't look too happy. And I personally prefer people who are actually in a good mood serving/cooking my food. But that's just me. I'll hold off further judgment until I see a trailer. 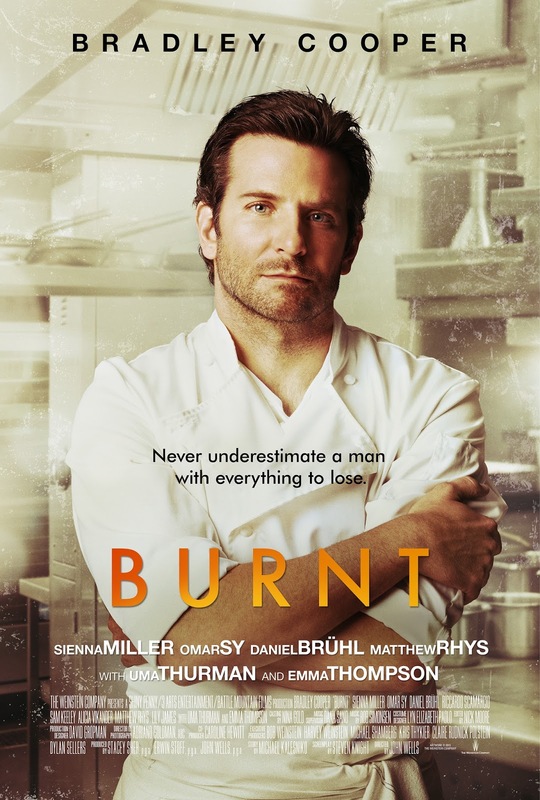 BURNT hits theaters everywhere on October 23. Hm. Sounds interesting. I won't write it off yet, but Cooper's not my favourite anything. And chefs are actually notoriously angry people. I really liked Chef though. Julie and Julia was good. So was The Hundred Foot Journey starring Helen Mirren. I also kind of liked Chef, though not as much as the first two.